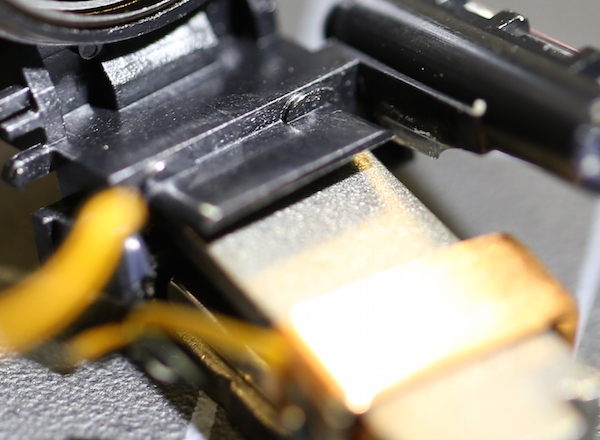 If you’re like me you like to know what’s going on inside your camera or lens to some degree. They are tools, and if I want to get the best use out of my tool I need to know it’s strengths and weaknesses. You may not have noticed, especially if you shoot just Canon or Nikon, but there’s been a quiet change in autofocus motors going on. Or you might have barely noticed marketing-fluff terms like ‘linear focusing’ or ‘electromagnetic focusing’ without really understanding what they meant. Even if you understood the general terms, you probably aren’t really certain how they work, or how they might be better or worse than what we’ve been using. So I thought some of you might like taking a look into what might (or might not) be a big deal: the changes that are being made in autofocus motors. Today I’m going to discuss linear electromagnetic focusing motors. I may do another post about linear-piezo and ring-to-linear piezo motors later, but those are, so far, less common than the electromagnetic motors. Back in the days when ships were made of wood and photographers of iron, you would focus your lens by moving the whole lens (or the whole optical assembly) closer or further from the imaging surface. This worked just fine but it was slow and often a bit clumsy. Later on, lenses were designed so that just one element or groups of elements moved on a linear track with a tooth-and-rail gear. 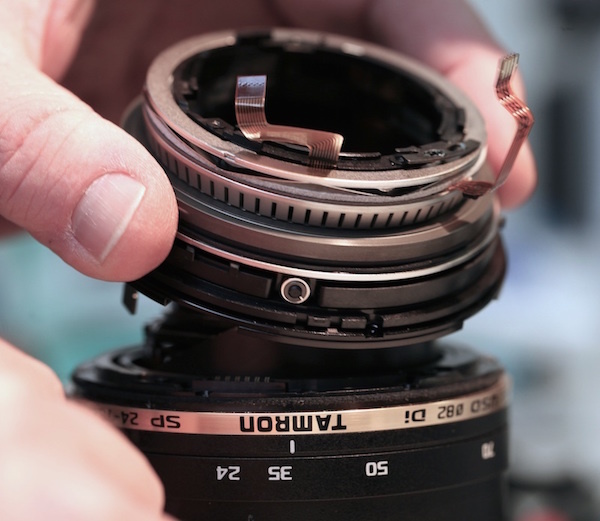 If you’ve ever used a macro rail or shot with a Lomography Petzval lens you’ve done this. Before long someone figured out that it would be convenient if you moved the focusing element nearer or further by just turning a barrel on your lens instead of twirling a knob. This is where the helicoid barrels of which we speak so often came into play. (Helicoids also move zoom elements in zoom lenses, but zoom lenses didn’t come along for many years.) 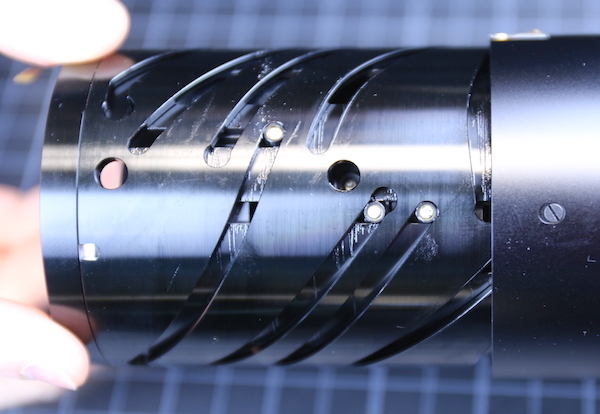 The moving lens element(s) have rollers that pass through the slots in the helicoid barrel. When the barrel is rotated the groove moves the lens forward or backward within the barrel, rotating it as they do. Much later on, autofocus was developed. The ‘auto’ part of that required that the lens has a motor to move the focusing element without any input from the photographer. At first, small, geared direct current (DC) motors were used for this purpose. In the 1990s, ring USM (ultrasonic motors), which were definitely quieter, faster, and probably more accurate than DC motors, became commonly used. There have been some other motors used for autofocus. 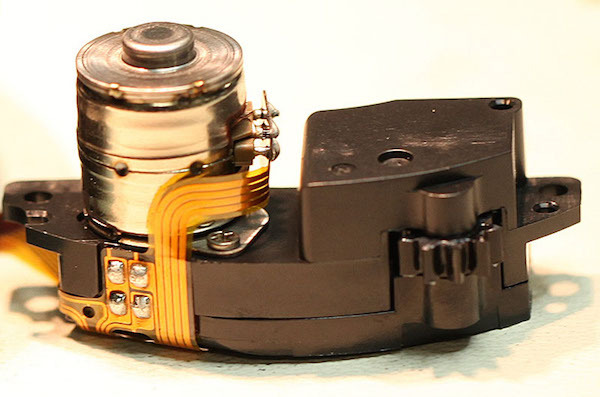 Stepper motors, a type of brushless electrical motor that moves more accurately than regular motors, are used in some lenses for improved focus accuracy (Canon’s STM motors are an example). Tamron’s Piezo Drive uses a non-ring shaped USM to move the focus. It is smaller and lighter than a ring USM, but I’m uncertain if it was better or worse as far as accuracy and speed. The terminology gets a little confusing here because a ring USM motor is technically a type of Piezo-electric motor. The important thing is that for all of these motors the focusing element moved in a helicoid slot, moving forwards and backwards as the slotted barrel rotated. Voice coil actuators have been around for a long time; driving the loudspeakers in sound systems (especially the sub-woofers), moving the arms of disc drives and DVD players, and a host of other things. They basically consist of a permanent magnet and an electromagnet wrapped around each other in some fashion. Applying current moves the electromagnet along the permanent magnet in one direction. Reverse the current and it moves in the other direction, (You can find a nice video demonstration here). Voice coils have some nice advantages over other types of motors: they are simple, silent, and very fast. 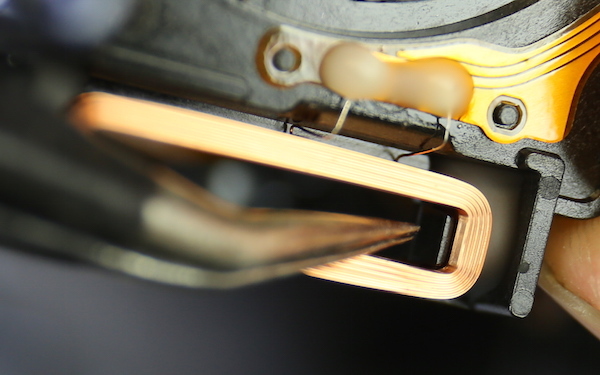 The focusing element in a lens with a voice coil motor is different, too. It doesn’t rotate in a helicoid to move backwards and forwards. It slides directly up and down on a couple of posts inside a small subassembly. It seems simpler to just slide a lens up and down rather than rotate it through curved slots, so you can see there are theoretical advantages to such a system. Of course, like anything engineered, there are usually both advantages and disadvantages in practice. I get that the new system is quieter. It does seem likely it’s faster. It might even be more precise. But I got kind of uncomfortable. All I could think of was why if you have this awesome new technology, why aren’t you telling us all about it? Even more, why are you kind of vague in telling us which lenses have which types of the motor? My paranoia increased when I saw that the linear electromagnetic focusing motors (LEMs) in the Sony FE 24-70mm f/4 and FE 55mm f/1.8 lenses broke a lot. So I decided we should poke around in some of these new lenses and see what we could see. I think of this as Type 1 because it’s the simplest and it’s the first kind we saw regularly. (Admittedly, part of why we saw them regularly was they broke regularly). It might actually be the type 12 for all I really know. This is the type of motor usually (but not always) identified simply as ‘a linear electromagnetic focusing motor’ in the product blurbs. The example below is from a Sony 55mm f/1.8 lens but this general type is found in a number of other lenses (I’ve put a table of what type of AF motor is in which lens at the end of the article). Looking at the focusing assembly from above, you see that the focusing element is set into a plastic tray. The tray is attached to an electromagnet that slides up and down on a permanent magnet (blue line) and two metal posts (red lines) to keep it from wandering around too loosely. If we take the focusing element and motor out of the barrel and look at it from the side, how it works may become more apparent. The permanent magnet is the smaller part that the blue line points to. There are two other pieces of metal that make up this very simple motor: the U-shaped piece at the bottom of this image and the flatter metal plate on the top. They are held together by the force of the permanent magnet, which is really pretty impressive. It’s nearly impossible to pull the two pieces apart using our fingers, we have to insert a small object to pry them apart. 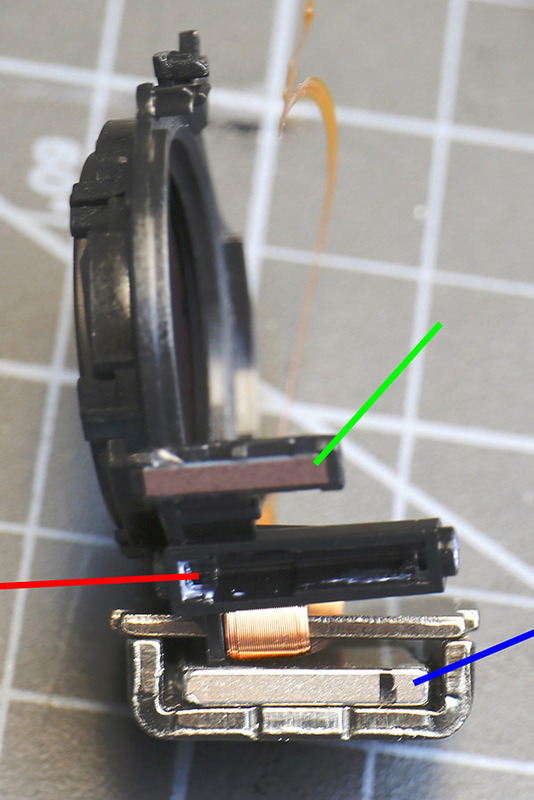 There is also a position sensor (green line) fixed to the focusing element. The red line points to a well-lubricated plastic groove that slides up and down over the metal bar you saw in the picture above. That’s it. Very simple. The copper electromagnetic coil slides up and down on the flat metal plate of the permanent magnet when current is applied. 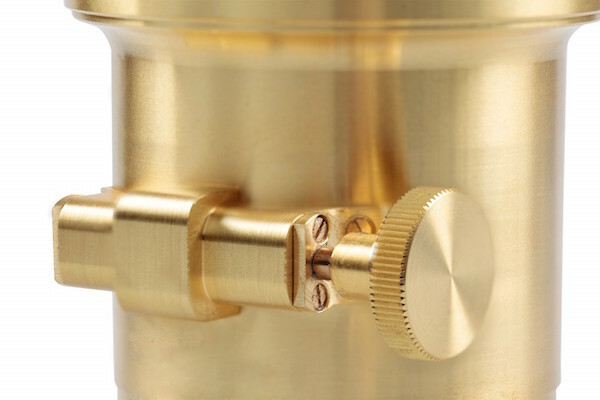 Since the copper coil is attached to the plastic plate encasing the focusing element, it moves the focus element. I want to emphasize the part about ‘the copper coil is attached to the plastic encasing the focusing element’. The method of attachment varies, and it’s important. 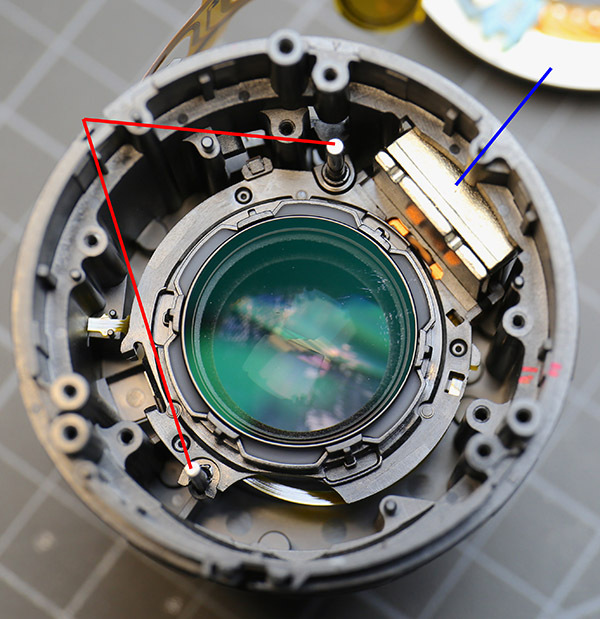 In this particular lens, the electromagnetic coil is simply glued to the plastic of the focusing element at one end (red line points to the bit of glue which has obviously failed here). If the glue fails then the coil separates from the lens element. If that happens the coil slides up and down quite happily when current is applied, but the focusing element just sits in one place. Since the coil isn’t attached to anything, it rattles around loosely when you try to autofocus. This is the dreaded ‘buzzing autofocus death’ that can happen with LEMs. The Type 1 motor with flat-glue-only is found, as far as I’ve seen, only on the Sony FE 55mm f/1.8 and FE 24-70mm f/4 lenses. These are the two lenses we find have frequent AF motor failures; we’ve reglued dozens of them. Why did they choose to rely on only flat surface glue? My only thought is because someone made a stupid mistake in design; they believed the glue would hold as well as the glue manufacturer said it would. I suspect we won’t be seeing any more Type 1 motors going forward, but then I also expected we’d see a change in the existing lenses using it because it should be a simple change. But that hasn’t happened yet, at least not that I’ve seen. 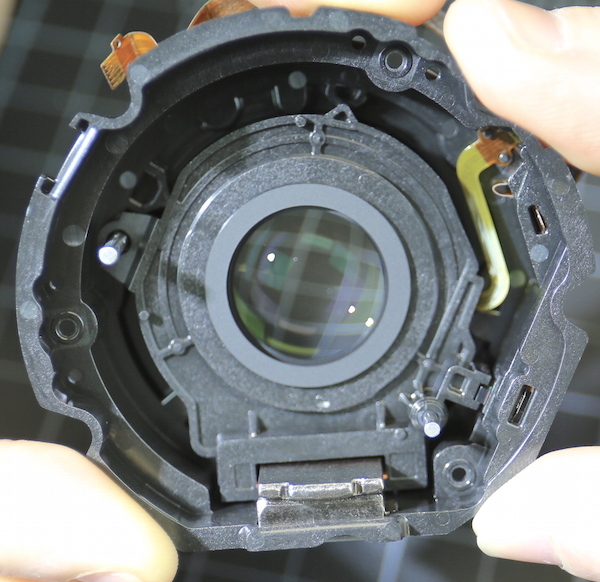 There is a slightly different type of single LEM system found in Sony lenses. I call it 1a, because it’s better than 1, although it was around before the Type 1. The FE 16-35 f/4 lens and even the FE 16-70mm lens have are type 1a, as are several others. 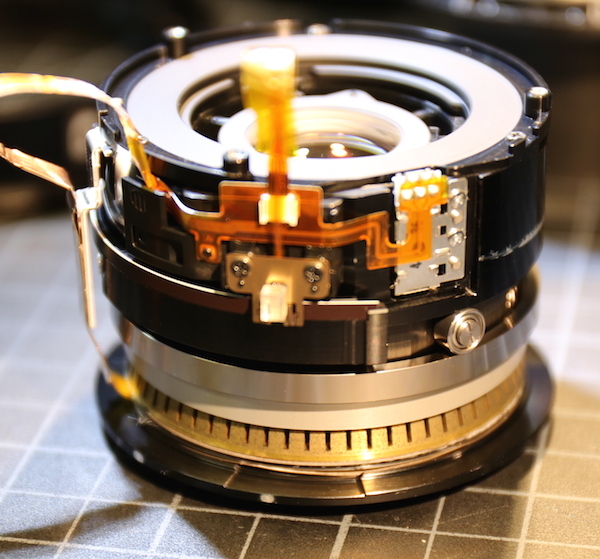 Below is a picture of the Sony FE 16-35 lens autofocus motor. From above it looks identical to the Type 1. But these types of motors have one critical difference that isn’t obvious just looking at them at first glance. 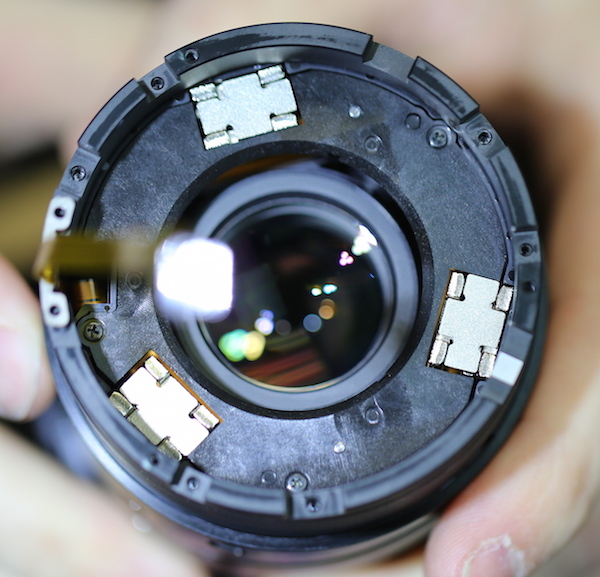 If you pry the coil off of its mount (and we had to pry one up because we just never see the kind of AF failures with these lenses we do in the previous type) you can see this very simple difference. Instead of just a flat plate at the bottom of the electromagnet coil, there’s a back that goes up inside the coil, two pieces that go along either side and a couple of sculpted areas in the base, all of which hold glue. It makes a much stronger bond, obviously, and explains why we don’t have to repair these lenses AF systems. So that’s my definition of Type 1a: a Type 1 motor with some reasonable mechanism to hold the electromagnet to the focusing plate. The Zeiss Batis lenses also use an LEM for focusing. We expected it to look very similar to the Sony AF motor and it does. Here’s the Zeiss from above. It’s actually more than similar. It’s almost identical. Same 2 sliding posts in the same position. Same magnetic motor and electrical coil. 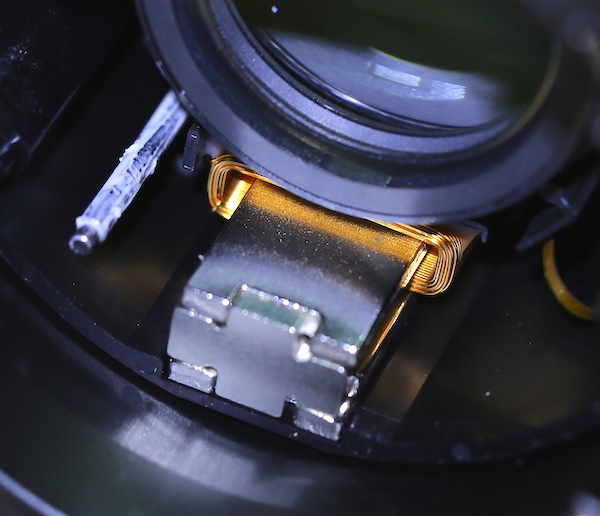 There is one difference: the Zeiss lens encases the electromagnet entirely in a plastic box attached to the mount, rather than just gluing it onto the mount. We actually opened the plastic box up and saw that it is fairly filled with glue and there are also plastic clips inside holding it in place. 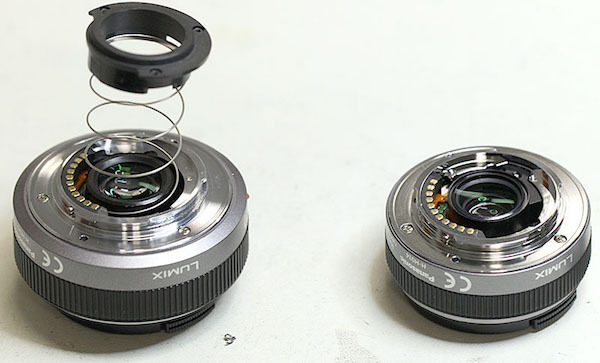 These differences are in the plastic mount holding the focusing element. The permanent and electromagnets, the metal housing of the motor, two sliding rods and everything else about the electric motors are identical. But that’s not too surprising, Sony and Zeiss collaborate on lenses. Fuji also has LEM motors in a number of their lenses. They are very similar construction to the Sony with slightly different plates, but we’ll show that in the Dual LEM section since Fuji, as far as we can tell, generally uses at least dual motors. Fuji lenses, as far as we’ve seen, also always attach to the electromagnet with more than surface glue, so they all would meet my Type 1a classification. Two companies, Fuji, and Sony have released Dual Linear EM focusing lenses. Not surprisingly, these have two motors moving the focusing element. Below is a look at the Fuji 55-200mm motor. You can see the two EM housings and there are still two metal sliding posts. The metal housing the permanent magnet is slightly different in the Fuji: instead of one flat and one U-shaped piece, there are two flat pieces going up-and-down and two I-shaped pieces, one on each end, making a box. You are looking down on the I-shaped top piece in this picture, and can see the top tabs from the two vertical pieces. Here’s an angled view showing more of the vertical piece. For comparison, here is Sony’s dual LEM from the FE 70-200mm f/4 lens. 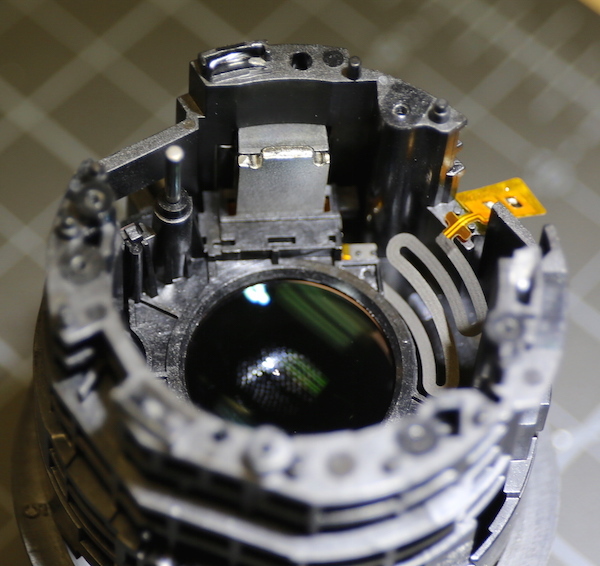 It has the same metallic parts as the Sony single LEMs we saw above, although in this lens the plastic completely encases the electromagnetic coil, much like the Zeiss Batis lens did. You can see an obvious difference in the spacing of the motors; Sony has theirs 90 degrees apart while Fuji’s are more like 150 degrees. I don’t know if one spacing method is superior to the other but it seems the focusing motor might have less play with the 150-degree spacing. But that’s just me guessing. It may make no difference at all. I should add that all Dual Motor LEMs we’ve seen have some plastic fastening mechanism like a type 1a in addition to just glue. Only Fuji, so far, has gone past two motors, and that only in a couple of lenses. The Fuji 50-140mm lens has three LEMs, for example. While the Fuji 90mm Macro has four. Why more motors? There must be a good reason because three or four motors has to be more expensive than one or two. I assume the most likely reason would be more power to move a larger element. If my understanding is correct, LEM motors are fast and silent, but not as powerful as a DC motor. There could be other reasons, and I’ll speculate a bit later. Well, you got to see some Linear Electromagnetic focusing systems. We saw that the working parts are very similar no matter the brand. If you’re interested in speculating about that do a patent search and draw your own conclusions about who is making what for whom. I get in enough trouble without doing that here. 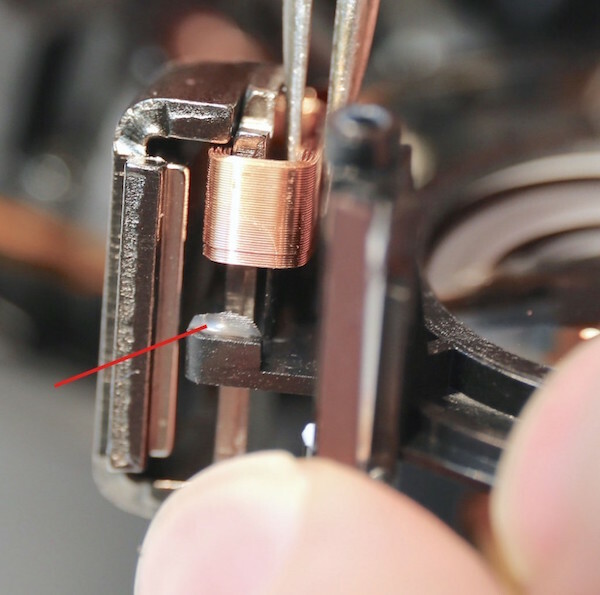 We also saw that it seems the simple things, like connecting the electromagnetic coil to the focusing element, can cause problems. Other than that issue, the only problems we’ve seen are a couple of lenses that were dropped and stopped focusing because one of the metal rods had jumped out of place. Except for the Type 1 systems we’ve seen nothing to suggest these motors are less reliable than more common ones. What Did We Speculate Today? Given that the manufacturer’s claims that are supported by outside facts, we know that LEM systems are fast and silent. (By fast, I mean move the element fast, not necessarily lock onto focus fast, although that might also be true.) Some manufacturer’s claim that they focus more accurately than other types of lenses, but I’ve found no outside data to support that, and ‘accurate focus’ is a very vague term. When the marketers say things like ‘more accurate’ my first thought is ‘than what’? One other thing that isn’t mentioned very much, but is absolutely true, because it’s already happening: LEMs give lens designers some freedom they haven’t had before. The focusing elements can be put inside a zooming group. More than one element in the lens can move for focusing or compensation (this can be done to some degree with helicoid AF systems, too, but it could be easier and more flexible with LEM motors). This is already being sort of done in a couple of Sony lenses. 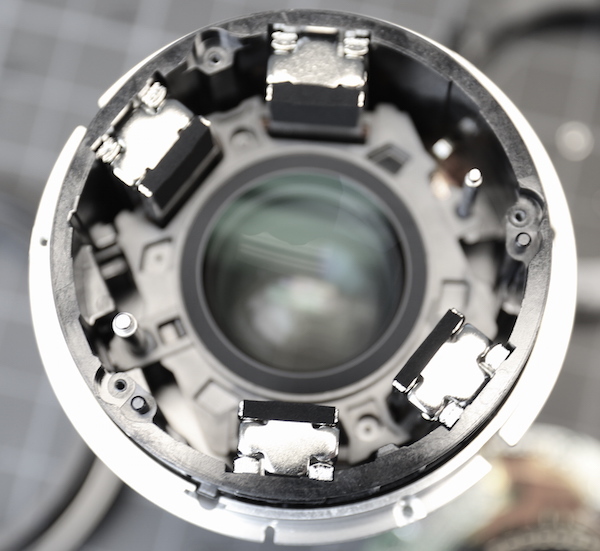 The FE PZ 28-135 lens, for example, uses a ring Piezo motor to move the zoom group in the front of the lens. While a dual linear EM system moves the focusing group in the back. In the upcoming 70-200 f/2.8 G Master lens, there will be a similar set up moving two focusing groups. If someone wanted to, they could make elements move in opposite directions during focusing, or have a second element move as a focusing or zoom compensator, or whatever. I expect we’ll see some innovative things. Some of those innovative things will be better. Some will just be innovative. The rest of this is just my thinking out loud. Whether any of this is accurate or simply my ingrained paranoia and random dreaming, only time will tell. It appears, at least for right now, that single LEMs are most suitable for small, light, focusing elements that don’t have to move very far. Bigger elements probably need multiple motors. LEMs may use less electrical power than USM motors, but I don’t know if this would be significant enough to extend battery life. The focusing group in single-motor systems seems awfully loose to me. I’m sure it’s better when power is applied. I’d like to think that lens designers took this into account and therefore this doesn’t increase sample variation. But some single LEM lenses are also some of the most variable lenses we’ve tested, so I’m at least suspicious. I’ve also considered that multiple LEM systems are used partially because they result in less looseness of the focusing group. The only fact I have to support this (other than the multiple focusing motor assemblies aren’t as loose) is that the Sony 70-200 f/4 (two motors) is less variable than the 24-70 f/4 and 55 f/1.8 (single motors) so consider this purely speculation on my part. I’ll repeat again, this is with the power off. Things are probably much tighter with the power on. This may just be another example of Roger’s paranoia. In theory, if good strong glue and a reasonable clamping system is used, one would think the electromagnetic motor should last a long time, perhaps longer than ring USM motors do. On the other hand, the lubricated sliding assembly may get loose or sticky over time. I have no idea. Time will tell, but time takes time. This is really speculative, but multiple LEM systems (I’d say three motors minimum) might actually be electronically adjustable. The firmware could actually tilt or perhaps even center the focusing element by altering current to one or more lenses. I’m pretty certain this is NOT being done now, but I wonder if it’s at least theoretically possible. 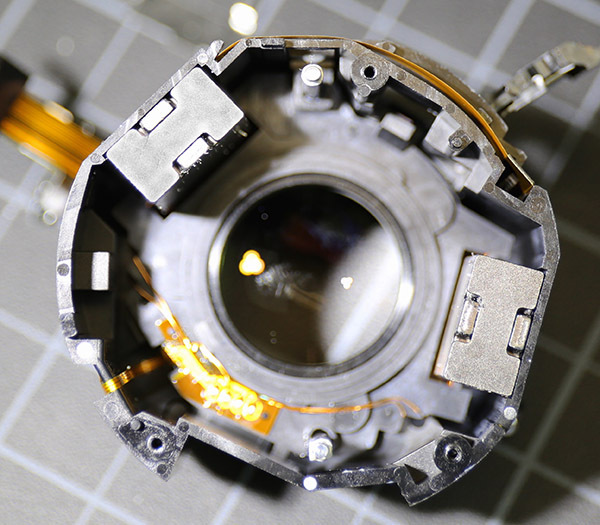 For the near-term, we have several other lenses we want to dissect and look at their LEM motors, and we also need to examine some linear-piezo motors more closely. For now, here’s a table showing some of the more common linear focusing lenses, what the manufacturer says about their drives, and if we have actually looked inside, what type of drive we’ve seen. Is it that nobody cares, or that many of the lenses are so inexpensive that they’re not worth attempting to repair? Surely *some* of them are worth repairing… (e.g. Panasonic 42.5 1.2, Olympus 75 1.8, any of the big telephotos…)? Good point, I would guess all mirrorless systems just run a feedback routine without the need for a specific position drive location, unless they drive quickly to the “neighborhood” and then fine tune with sensor data. Yeah this would be a definite disadvantage here – and it’s consistent with Roger’s observation of “looseness” – the Sigma 19 for example, is known to rattle when not powered. At least for Sony’s E-mount system – this isn’t relevant as the autofocus design is such that it’s self-calibrating. (Since focusing is done on the sensor, microadjustments due to sensor/AF site manufacturing variability aren’t needed). I think this is why we tend to see LEMs for mirrorless systems with on-sensor focusing. It’s interesting to me that with the proper software, it might be possible to tune the focus motor motion profile to optimize a specific lens, i.e. 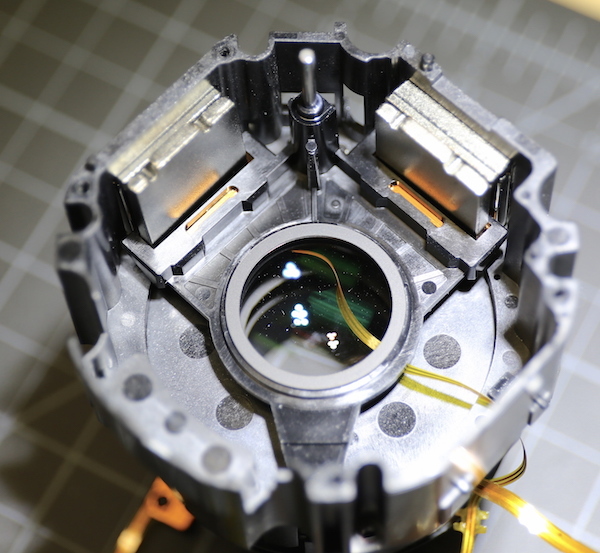 each lens has different tolerance variation, an automated system could drive each individual lens to specific test focus points, and individually calibrate each motor’s motion profile to match the optics in that specific lens. So lens A might move the focus group 20 microns to focus at 10 ft, and lens B might move the same group 20.5 microns to focus at 10 feet. That might fix the variation and/or allow more tolerance in mfg to lower cost. 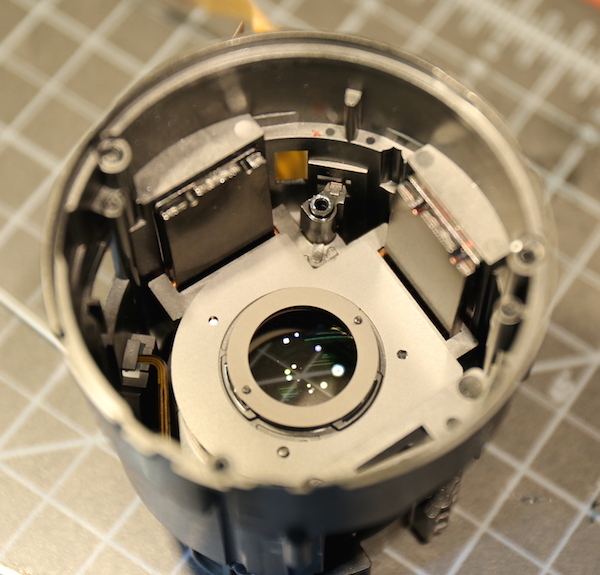 The second photo is showing cams and cam followers (for a zoom mechanism, incidentally). Those are not at all the same thing as a helicoid. This is pretty fascinating. In theory this ought to (eventually at least) be less expensive to build and maintain due to relative simplicity. I’ll be anxious to see if it actually plays out that way. Is it not simply too expensive? My guess as to why multiple motors: if you have only a single motor on one side of the lens group, there will be a torque induced on the group, which could mean that it would bind to the posts that it is meant to slide on. Imagine a tube sliding on a cylinder: it will slide smoothly if it is aligned properly, but if you apply a twisting force (perpendicular to the axis of the cylinder) it will stick. @Lensrentals: The Fuji XF 90mm is not a macro lens, as far as I know. Great article, I am sorry they are using such simple EM actuators. I was hoping they had gone to linear stepping motors. I work with them on robots and they are crazy powerful, fast and accurate. How accurate? they are used for the stage on advance lithography scanners to patter chips and achieve an overlay accuracy of 2nm. If one controller manages all of them, they will be driven off of the same electrical connections and it is impossible for them to be driven significantly differently from each other unless a motor’s connection fails, in which case it becomes loose and exerts more or less no force on the assembly. Also, if you have multiple motors and one moves a little differently than the others could the assembly get cockeyed and get stuck? I was wondering why we had not seen such AF motors before, given the simplicity of their design, but I guess the need to constantly power the LEM to maintain focus and to rely on a fly-by-wire system for MF might be part of the reason. 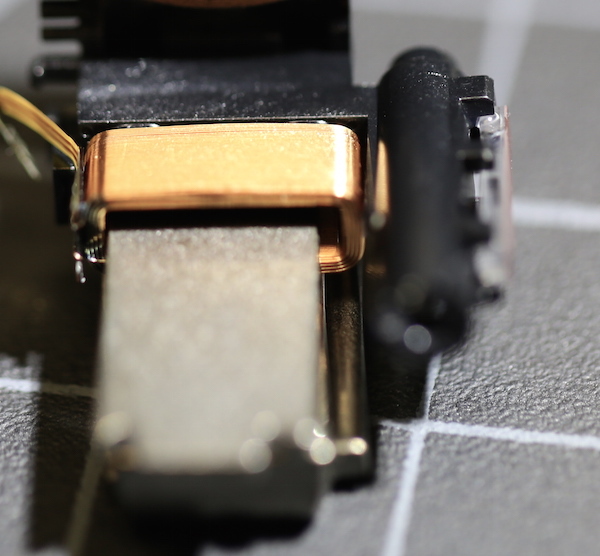 I also guess it only works with optical designs with a relatively small focusing element (IF or RF design). I have the 23, which has been available for about 1-2 years. It’s faster and quieter than the 35/1.4, and apparently not quite as fast and not silent like the 35/2. So all three may be different. I’m no electrical engineer, but it looks to me like the chances of a motor failing are fairly slim, due mostly to how simple they are, obvious-in-hindsight design faults notwithstanding. There’s just not much in them that *can* go wrong. Should owners of the FE 24-70 f4 and the 55mm f1.8 be worried? Thanks again for the interesting article. It’s intriguing to see triple or even quad linear motors. I just started to wonder what happens if one of those four motors shuts down over the lifetime. Can the lens still focus with three remaining? Or how likely it is in the first place that only one of those four motors stop functioning. Are they all driven from the same driver/circuitry? I guess that some engineer might say that four motors will quadruple the changes that something will brake evantually, but I guess only time will tell. Thank you Volker! No I really did learn something today! Very interesting blog article. Just one thing: When you’re saying “LEMs may use less electrical power than USM motors, but I don’t know if this would be significant enough to extend battery life.”, I’m not quite sure if that is really true. Voice coils _might_ be using less power to move (if there’s a reasonably strong permanent magnet and many space consuming windings in the coil to create relevant flux density and hence force). But what is happening if the focus has been set? For ultrasonic motors or especially the good old Nikon screwdriver system, you can switch off power supply at that point. Helicoids can be designed in a way that they are self-locking. Voice coils might have a problem here: No flux, no retention force. Probably the same as in stepping motors, they’ll turn (rather) freely if they are not connected to the controller. Since a LEM is just a trivial coil, you might be actually able to tap into its power supply with some kind of current*voltage sensor, then see what is happening if the system is idle after setting focus and if the designers implemented anything like a powersave mode. Probably not, because if focus creeps, the image won’t be retained in the viewfinder. P.S. : Of course, also linear drive piezoelectric motors are available. They are precise (up to one nanometer) but neither small (in the order of 20x20x10mm^3 and 25g) nor very fast, nor cheap. Typical power consumption for such a device: Around 5mW per Hertz of step frequency with a holding force of 7N, a maximum stroke of 80mm and up to 15mm/s. Scott, we’ll fill the table out over the next month or so. Fuji may have some more surprises for us. Very interesting. I hope you will post an alert when you can add the Fuji primes to your table. The 23/1.4 and 35/1.4 are pretty substantial. Do they get two LEMs? The new 35.2,0 is very light and fast. Just one?